When I started this blog almost a year ago, I had a few goals in mind. First, I needed a place to keep all my homebrew content. I am not the best at note taking so I thought if I started a blog it would make me more honest, and I would have a resource to refer back. The second goal was to push myself out of my comfort zone by publicly challenging myself to try new things…and that leads me into my third goal. I wanted to experience every aspect of beer brewing / making as possible, not just from a homebrew point-of-view but from every angle I could think of. The form the third goal took was to write to local breweries and see their operation first hand. I started off this journey by contacting my friends at DC Brau Brewing Company and asking if I could tag along and be “assistant brewer for a day” for a batch, and they said yes. That was an amazing couple of days, I learned so much brewing that beer with them. Since DC Brau is a production facility, I thought it would be good to try to repeat this experience with other types of breweries. There are several “levels” to the brewing industry each with their own challenges, processes, and points-of-view, i.e. brewpubs, nanobreweries, contract facilities and farm breweries. There are a couple of farm breweries in Maryland and I realized talking with them that I had an opportunity greater than just brewing a beer at these farms…I could participate in the harvest of some beer ingredients. Specifically, I can go to a hop harvest. A HOP HARVEST! This journey takes me back from a glass of beer to the origins of the beer…back to the very dirt it came out of….in raw, wet hop, ingredient format. I get excited about beer and beer related activities all the time but I’m about as excited about this as possible. 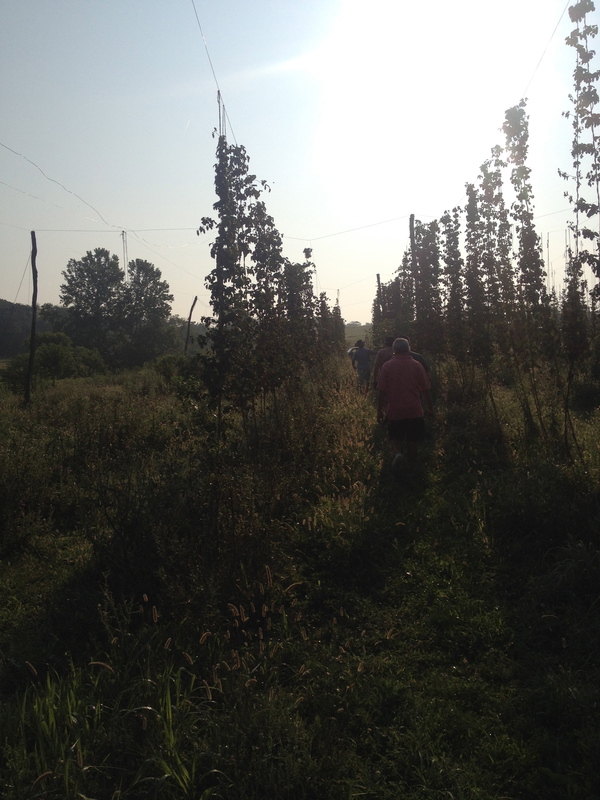 I love hops, I love farms, I love being outdoors and doing manual labor…this is going to be a great experience. There are several hops farms in the Northeast, in fact there is a new-ish movement to rebuild the hop market that disappeared about 100 years ago in the region. There used to be a lot of hops grown in the mid-Atlantic region. The Northeast Hop Alliance is a trade organization devoted to building back up production and creating the market for locally grown hops. They preach sustainability and local products. I love the idea after a couple of years of hop shortages in the 2000s, I think more places should be growing hops…maybe even myself someday soon. The farm / brewery that I have the best relationship with currently is Stillpoint Farms / Milkhouse Brewery, so I decided to start there. Stillpoint is a small farm with sheep, bees, horses and some crops, including a few varieties of hops. For the 2014 harvest, I decided to tag along and get my hands dirty harvesting. I volunteered to harvest one of my favorite hop varieties, chinook, it was also conveniently on the weekend. Harvesting hops can be separated into few different steps. First, cutting down the bines. Second, stripping the leaves and cones off the bines, third separating the leaves and the cones, and finally drying / packaging. I’m not going to discuss packaging except to say that hops should be kept out of the light, in cold storage, and not in the presence of oxygen after they’ve been harvested. Hops are bines (not vines). They grow vertically around an existing support in a helical pattern and can grow to a few dozen feet. At this farm (and others I’ve seen), there is a metal cable that runs parallel to the ground about 25 – 30 feet up. Ropes are staked to the ground and tied around the cable, this provides a substrate for the bines to wrap around and climb. The bines are spaced several feet apart in rows that are about 6 feet apart. Before the bines were cut off the metal cable, they were all cut at the base, about 3-4 feet off the ground. There were no cones that low on the bine. This was done so when the tops were cut (video below), the bines just fell to the ground and could be piled in the bed of the truck. I couldn’t resist picking a flower and seeing the lupulin glands on the inside. The acids used for flavoring and bittering hops are found in that yellow, powdery, organ inside the flower. This flower was actually a cascade hop from the neighboring row of plants. I rolled the flower between my hands briefly and smelled the residue. It was amazing, I loved it. The chinook were incredibly aromatic as well. By the end of the day, my hands were stained with the resin and the smell was with me the rest of the evening. 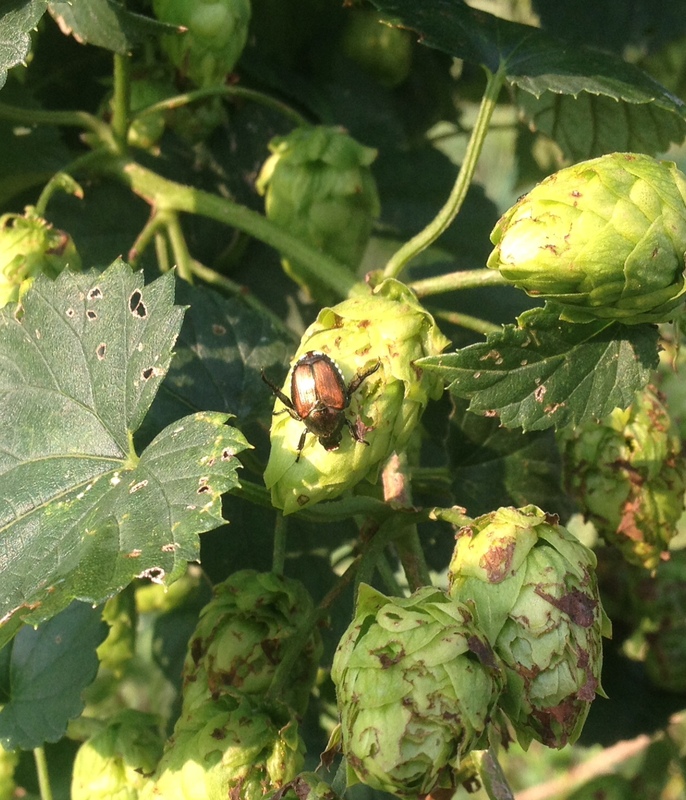 The Japanese beetle is an invasive species that is currently working its way through the hop crops in the US. Here is a photo of one of them on a cascade hop cone. You can see the damage this little guy (or his brethren) did to the leaf in the photo. Many of the leaves on the bines were shredded by these guys. 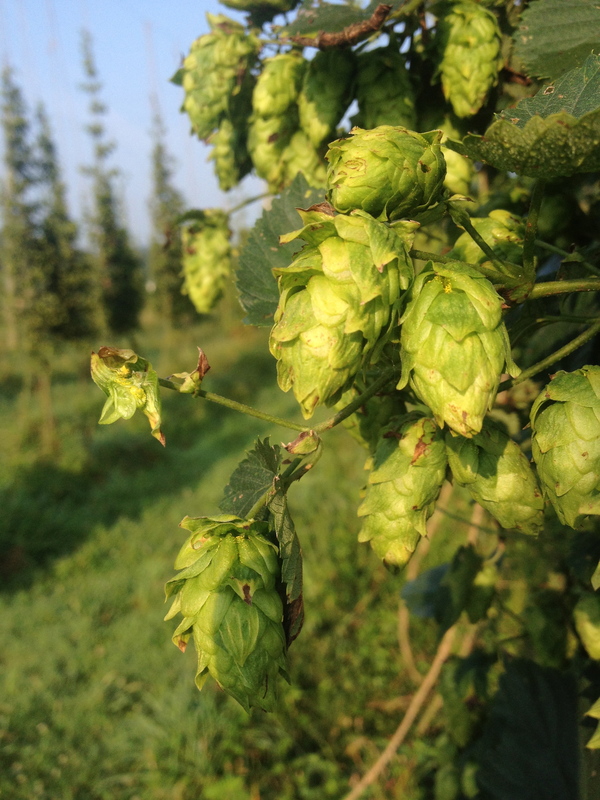 Tom Barse, the owner of Stillpoint farms, joked with me that they were making our job easier by eating the leaves preferentially over the hop cones…and that is true but I know that this insect is generally a problem for hop farmers even if they leave the cones alone. If a plant has fewer leaves, it can’t produce as much energy and support as much growth..less growth means less flowers and less healthy flowers. This beetle is a big problem. Tom said that they don’t spray, I won’t quote him directly but he said that his farm isn’t organic but they don’t use pesticides. They have too many beneficial insects that they don’t want to hurt or damage to get rid of a nuisance. He said as far as they go, when it gets bad is to use a mild detergent that only gives the plants a bad flavor to the insects but doesn’t actually kill them. I like this philosophy and honestly wasn’t surprised, since they have bee hives on the property as well. I imagine pesticide would be a last resort only in that setting. Now that the bines are cut down, they were transported back to the barn to the stripper. Tom built all the equipment himself, he called it “farm engineering”…it is pretty impressive. This device strips the leaves and the hop cones off the bines (about 80-90% of the leaves and cones) and drops them in a box at the bottom. The bines are clamped to a few rings and pulled through the machines that has some metal loops moving in a circle. The loops sort of comb through the bines knocking off the material. The material that is remaining after stripping is picked by hand. It is less tedious than it sounds. After the stripping is done, what we have now is a box of cones and leaves (and a few short bines). The task now is the separate the leaves and the cones since we only care about the hop flowers. This was achieved using another piece of farm engineering, Tom’s hop sorter. I’ve seen these before but I’ve never used one. It is a fun and effective machine to sort these two things. 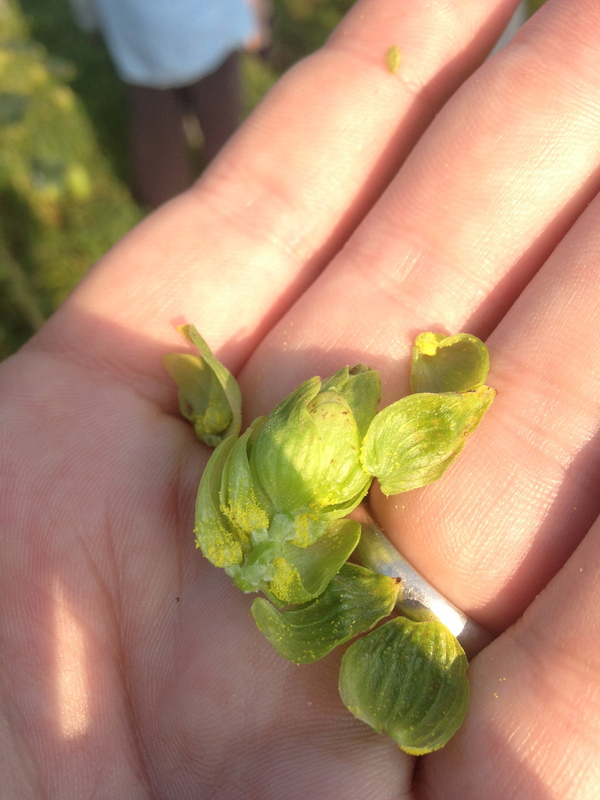 The hop flowers are roughly spherical, at least they are round. Leaves are pretty flat and big. The make-up of the sort is basically a screen that is moving like a conveyer belt. It is on the slope and the converyer is pushing everything up toward the top. There are a couple of box fans that are blowing on the belt as well pushing things up to the top of the machine. The leaves are pushed by the belt and the air and fall off the top while the hop cones just roll down the slope and off the bottom of the belt into a box. After two rounds of sending the hops through the sorter, there were almost no leaves at all, and the few remaining were picked out by hand. This was where I was stationed the majority of the day, it was impressive how well it worked if you were patient and poured the buckets of material on the conveyer slowly enough. Now that all the hops have been picked and sorted, the whole cones are poured into the dryer. The dryer is basically a plywood box where the base of the box is replaced by a screen, like the screen on a porch door or window. There is a duct that runs into the box that is hooked up to a blower that blows heated air into the box to speed up the drying. Tom says that they shoot for a temp around 105 F to dry the hops and the amount we picked should be dry in about 6-8 hours. Larger hop farms out west will heat the hops to about 130 or 140 F to speed up the drying even faster but Tom says that doing that can drive off more of the oils and the flavors and the Northeast Hop Alliance has agreed that lower temperatures for a little longer produces a superior product. 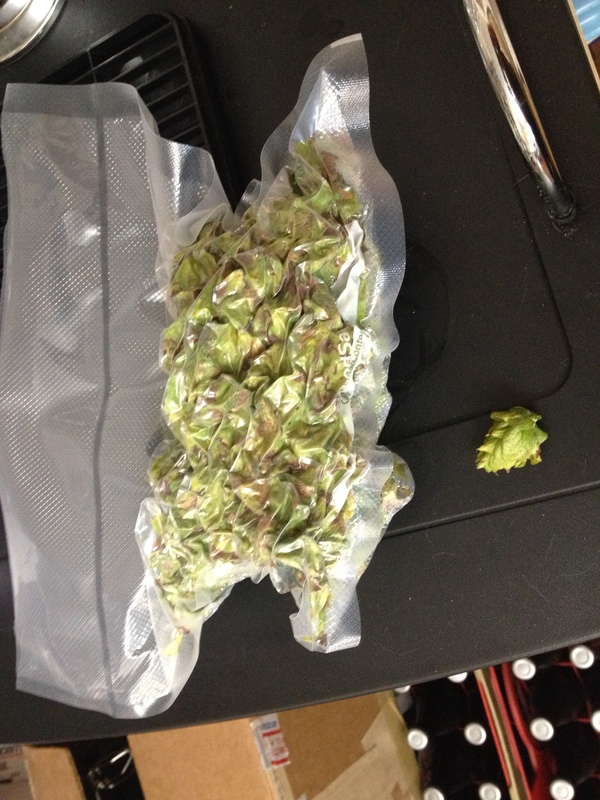 After drying, the hops are packed into 10 pound bags and stored in the cold until use. Apparently these hops will be pelletized shortly to make them even easier to store. 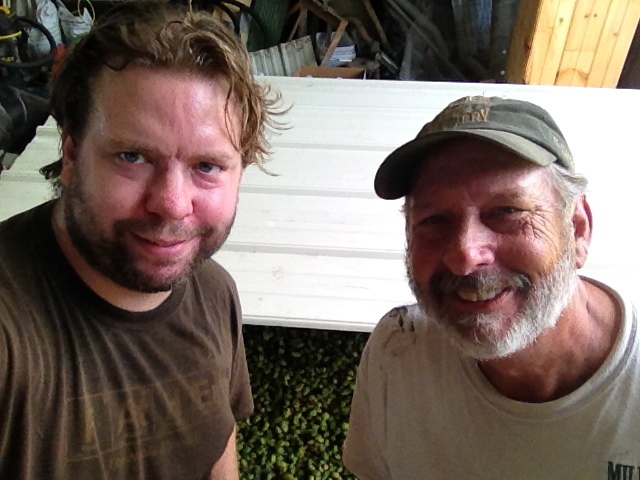 A moment of vanity, I took a photo with Tom (right) after all the hops were loaded into the dryer. It was a silly moment but when I asked if we could get a photo together he said, “A selfie? I love selfies.” so we did it. What I ended up with at the end of the day was 13 ounces of chinook wet hops…what am I suppose to do with that? Oh….right….I remember now…. What am I going to do next in this series? I’m hoping to do a nanobrewery or a brewpub. I’m taking to a couple of each of those. I’m also looking for a place that malts their own grain but I might have to trek out to a distillery to do that. I have options and contacts. Something will come up sooner or later. 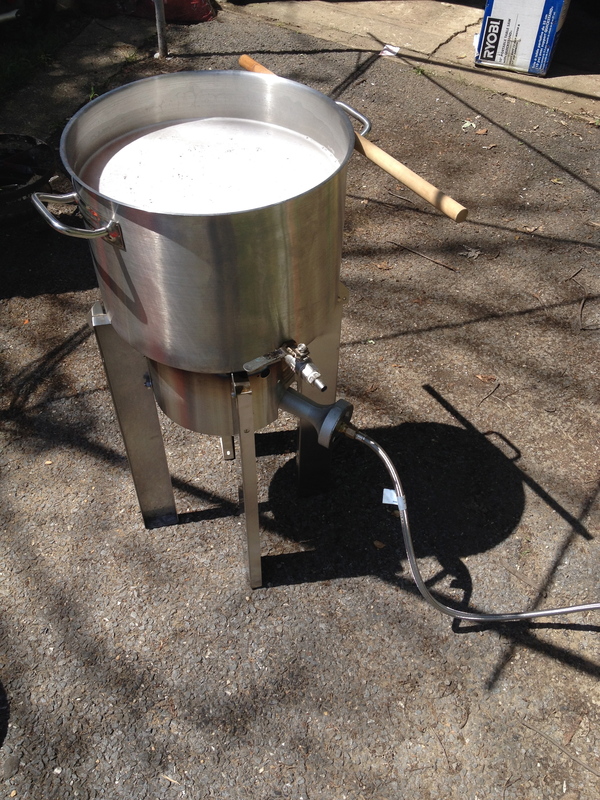 Stay tuned, in the meantime, more homebrew and some more beer science coming up. All of their contraptions have a certain Rube Goldberg feel to them- I love it! I’m always glad to see more of these small hop growers getting into the game to cater to home and craft brewers. This is a really cool series of posts. 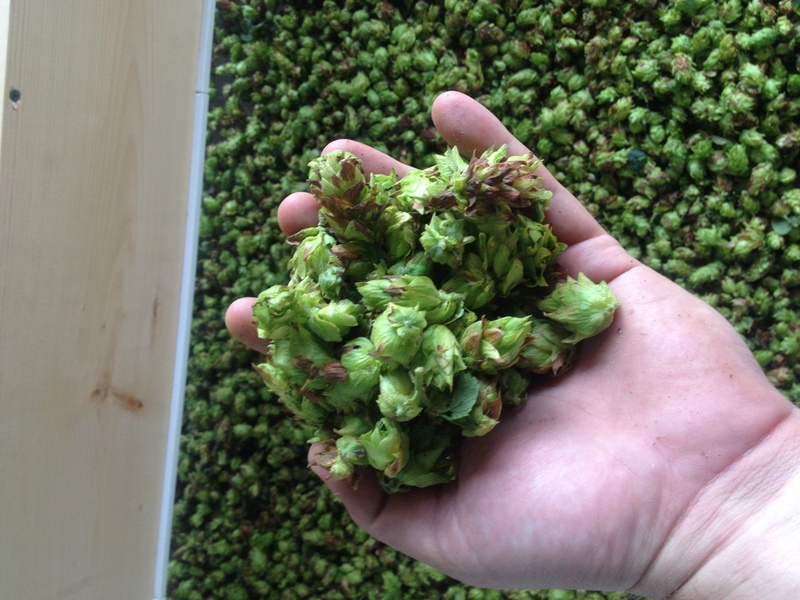 How have you gotten to know hop growers? 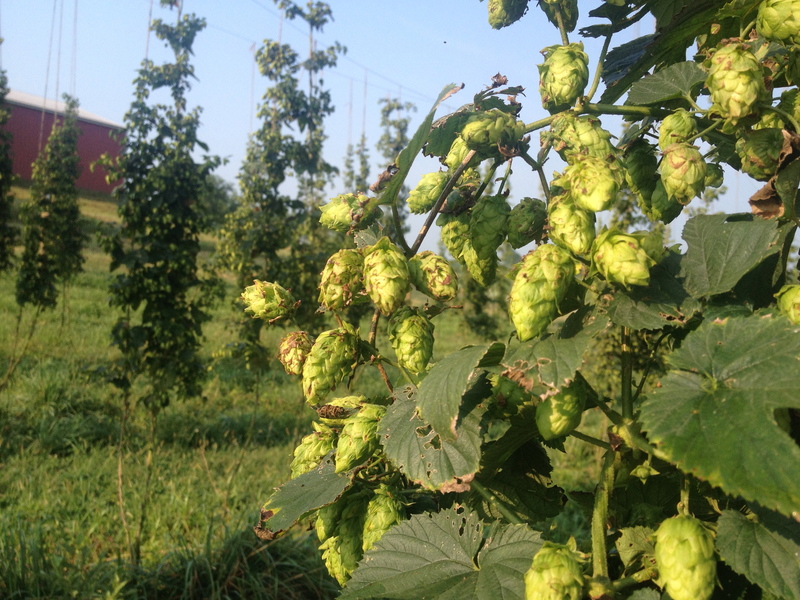 You say this is the farm you have the best relationship with – do you have relationships with multiple hop farms? At the homebrew level, I can’t even think where I’d have opportunity for forming such a relationship other than just contacting them out of the blue. Well, I guess I’m just lucky, and I’ve focused a lot of attention on the local beer scene, maybe too much attention. I’ve lived in MD for almost 5 years and when I got here there were 4 breweries within a 30 mile radius of my house. Now there are 20 and I’ve reached out to almost everyone of them before they opened, shared homebrew with them, or just talked about their setup. I’ve built up a lot of momentum in the local beer scene. The reason why I was able to brew a production batch at DC Brau so easily was simply I knew everyone that worked there from the head brewer to the two owners…our kids play together. In that same 5 year period, two “farm breweries” opened in MD, both of them hop farms, Stillpoint and Frey’s — I talked to both but I’ll likely end up brewing a beer at Frey’s so I decided to do the hop harvest this year with Milkhouse, maybe I’ll do Frey’s harvest next year. The farm brewery designation is only a couple of years old in MD and is a statute that was written by Tom at Stillpoint Farms, he’s a former lawyer / law professor turned farmer / brewer. I heard about the law and Farm Brewery Permit #1 being issued to Milkhouse and made it up there the second week they were open. The place was dead but Tom and I talked for a long time while we drank some wonderful English ales (his specialty). Every year he asks for “volunteers” to come out and help with the harvest and this year I made it a point to do so mostly for my own experience as I am seriously looking for a small farm at this point and for this blog series. As far as just cold calling people in the industry, I do that all the time. For this series of posts where I’m tracking down all the beer ingredients and trying to better understand how they are manufactured / grown / modified for use in beer, I contact all sort of places / people I have no reason to other than to just set one of these up. I just cold called a local distillery yesterday that has a floor malting facility. Some people are enthusiastic about talking about their process, some people are more standoffish. I can’t blame them for that but the more of these I get done, the less resistance I get. I’m hoping by the end of 2015, this “Grain-to-Glass” series can be a sort of stand alone primer on making beer at different levels in the craft beer industry or the production of beer ingredients. Ambitious but I think I can pull it off.